The red imported fire ant, a native of southern Brazil, currently inhabits eleven southern states, as well as isolated areas in New Mexico and California. In North Carolina, imported fire ants are found in 71 of 100 counties, including isolated areas in western NC. These areas are currently under quarantine by the U.S. Department of Agriculture and the North Carolina Department of Agriculture & Consumer Services (NCDA&CS), regulating the export of certain items that might carry ant infestations to other parts of the country. Even if you are not currently in a quarantined area, you should be aware of how fire ants will affect you and how you can control them because North Carolina’s fire ant infestation is expanding into counties adjacent to the quarantine zone. The ants expand naturally and steadily into new territory because of their high reproductive rate; mild winter weather has accelerated their movement. Current technology and control efforts are not expected to reverse this growth trend in the foreseeable future. In addition, long-distance movement often occurs because of human activities, primarily through the transport of fire-ant-infested nursery plants and sod into areas outside of the federal and state quarantine zone. From an agricultural perspective, red imported fire ants are nuisances primarily because they annoy field workers and because their mounds may damage harvesting equipment. Livestock injury and crop damage are usually minor. Fire ants have a much greater impact on the orna-mental plant, sod, and landscaping industries because of problems associated with shipping infested plant material into uninfested areas of the country. Mounds discovered in previously uninfested areas of North Carolina are frequently traced to landscaping performed at commercial and residential developments. For the general public, two aspects of red imported fire ant infestations are particularly annoying: the unsightly mounds formed in lawns and yards and the painful stings received when mounds are disturbed. 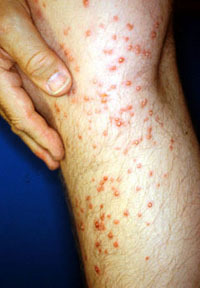 Within 24 hours after a person is stung, a pustule-like sore forms at each sting site (as shown here), which usually itches intensively. Scratching the pustule may rupture the skin, leading to secondary infection and scarring. A small proportion of people stung is highly allergic to fire ant stings and requires immediate medical attention. As red imported fire ants spread into more populated areas of the state, more people are likely to be stung. Encounters with fire ants can be expected not only outdoors but indoors as well. In other southern states foraging ants have invaded private residences and buildings such as offices, hospitals, and nursing homes. In these situations, fire ant control is more critical and potentially more difficult because of concerns related to both the ants and the indoor use of chemical insecticides. 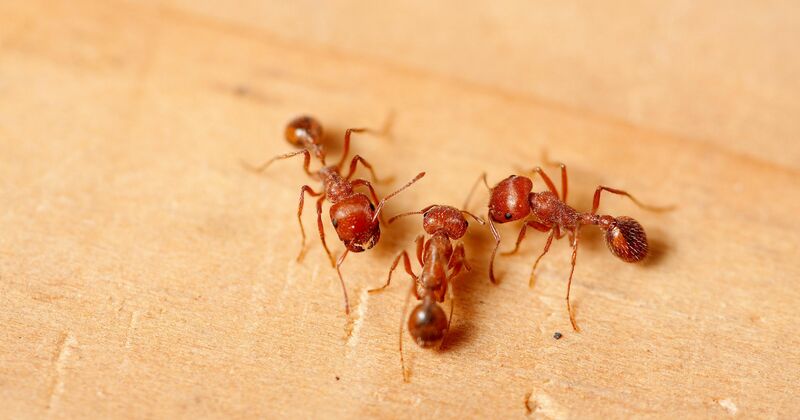 Adult red imported fire ants are reddish to dark brown and occur in five forms: (1) minor workers, about 1/8 inch long; (2) major workers, about 1/4 inch long; (3) winged males and (4) females, each about 1/3 inch long; and (5) queens, about 1/3 inch long. Fire ant mounds vary in size but are usually in direct proportion to the size of the colony. For example, a mound that is 2 feet in diameter and 18 inches high may contain about 100,000 workers, several hundred winged adults, and one queen. If you break open an active fire ant mound, you typically find the "brood" - whitish rice grain-like larvae and pupae. These immature ants will eventually develop into workers or winged adults. Mounds constructed in clay soils are usually symmetrical and dome-shaped; mounds built in sandy soils tend to be irregularly shaped. It is often difficult to distinguish the red imported fire ant from the tropical fire ant and the southern fire ant, which are also found in North Carolina. For positive identification, take a specimen to your county Cooperative Extension Center.